King & Cardinal is a legendary bakery in Himayatnagar known for its delicious burgers and cakes. Pretty much every kid in the area, in the 80s and 90s celebrated their birthdays with cakes from here, so the nostalgia as you walk in is real. Established in 1985, King and Cardinal is right on the main road, and hard to miss. 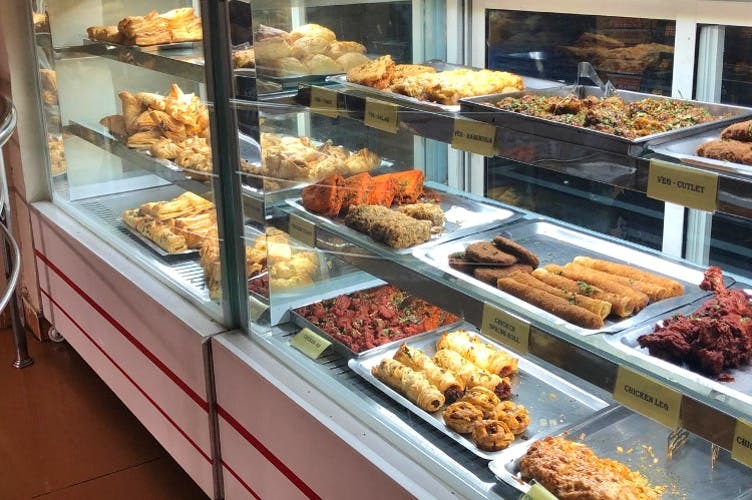 This bakery has been a popular choice among group of friends meeting over quick bites, as well as college going folk in the busy streets of Himayatnagar. Over the decades, the bakery has bifurcated, but the original location of this bakery, beside State Bank Of India still goes by the name of ‘K&C Bakers – The Originals’ today. The ambience here isn’t the nicest nor is the place the cleanest, but the food has won over thousands of people who claim it to be just as delicious as it was decades ago. The burgers, especially are a massive hit amongst people, so don’t be surprised if people appear impatient with wide eyes waiting for their burgers at the counter. From chicken burgers and paneer burgers to pastries of all kinds and pizzas, sandwiches, and hotdogs, you get it all here. We got ourselves a veg cheeseburger, and oh the taste of melted cheese is one to remember. The patty stuffing in the burger is very filling. We also got ourselves a butterscotch pastry for the nostalgia when we ordered their best selling butterscotch cakes at every party, and we do agree that the taste hasn’t changed. You can also get dry cakes like dil khush, plum cakes; puffs, and biscuits too. In fact, they have many kinds of biscuits like Osmania biscuits, moon biscuits, khaari biscuits here. You don’t want your party to be incomplete, do you? So grab party hats, candles, and sprays from here as well and relive your childhood. The bakery has two floors, so don’t worry if it looks crowded, you can always find seating upstairs. So, go ahead and have some delicious treats with your friends at this iconic place.